A Facebook post of photos of a police allegedly pointing and shooting gun at a civilian had stirred rage over the net. The photos posted by a Facebook user accompanied by a story about police officers allegedly taking advantage of their positions. 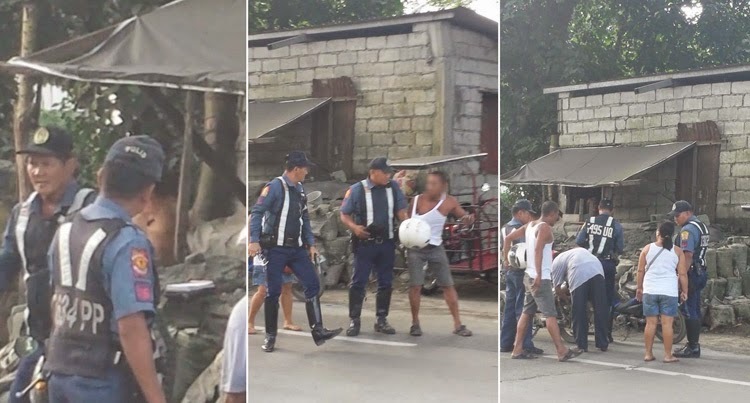 According to the Facebook user, the photo was taken in Payatas where the policemen were said to have put up a checkpoint without the usual mobile nor a sign that it was indeed a checkpoint. He said that this checkpoint had been calling out a lot of violations from the motorists. Furthermore, when an unknown motorist tried to protest about an issued ticket against him, one of the police pointed a gun and shot at him. The policeman said it was only a warning shot but the action was questioned on his post that has been deleted. Few hours later, the video of the incident came out and it was posted here. He opined that the shot could have hit a civilian as the gun was pointed towards a man and not towards the sky. The motorist was with his wife and the couple as well as the people around were surprised at the action. The Facebook user asked the post to be shared that it may reach those in positions and take actions against the alleged taking advantage of police position.